Susan's Disney Family: Our home away from home for the #DisneySMMC the enchanting Disney's Coronado Springs Resort. Our home away from home for the #DisneySMMC the enchanting Disney's Coronado Springs Resort. One of the things I love about Disney World is that things are always changing, there is always so much to do and see. I have been visiting for over 24 years and I still have not seen everything. Seriously, there are places and even rides I have not ever experienced. Recently at the Disney Social Media Moms conference I got to explore and experience a hotel that I have never had the pleasure of staying at… until now. 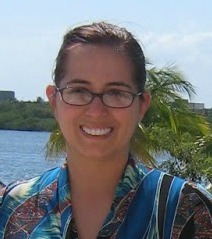 The relaxing Disney's Coronado Springs Resort. This enchanting resort brings the romance of Spanish Colonial Mexico, escape with the brightly colored buildings and all of the southwest themed charm. The hotel and the grounds are large, and well themed. Take a walk around the water, relax in the lobby, and soak in all of the amazing Disney design in this really cool hotel. So how are the rooms? The rooms are a nice size complete with two queen sized beds with dark wood accents. The room has a nice sized desk, ready for some work or just a great place to organize all of your stuff. There is a great separate area for your luggage and a wide counter with a sink. There is a curtain that separates the sink/luggage area and the bedroom leaving you privacy for getting ready. I like having the large area near the sink to store all of my toiletries. Yes they provide some great toiletries too, high quality H2O branded, shampoo, conditioner, body wash, lotion, soaps, and even a Disney mouthwash. 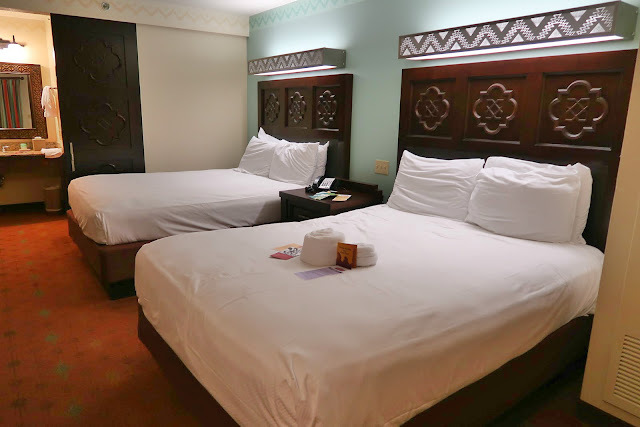 The beds are comfortable and perfect for relaxing after a long day at the parks. I just loved the dark wood accents and light blue colors in the room, it was just so light and airy it really transported you to another place. The hotel is not jammed packed with Disney characters, but it does have Disney accents here and there and the Disney charm is there. 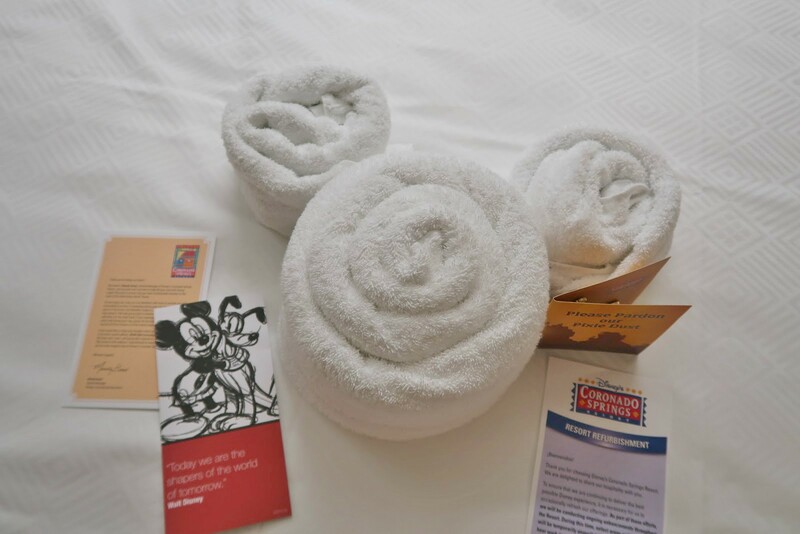 The first touch of Disney greeted us when we entered the hotel room, a towel animal mickey head! It was surrounded by hotel information and a special gift. Disney's Coronado Springs Resort is going through some upgrades and there was a bit of construction, and to give a bit of an apology they gave us a wonderful set of “Disney construction” pins. So fun! We were not bothered by any of the construction, they worked during the time we were at the parks and all was quiet at night. There are plenty of new editions coming soon at this hotel! There were plenty of great food options as well. From the Pepper Market, a quick grab and go or eat in restaurant that had just about anything you could want, from burgers to pizzas, to sandwiches, or tacos I could go on and on the selection was amazing! Open for breakfast, lunch and dinner. The Pepper Market did not disappoint. Find something for everyone at this food court, they have pancakes, omelets, French toast, breakfast burritos and Mexican fare, salads and sandwiches, grill items, hot sandwiches, pizza and pasta, kids’ picks and drinks. Plus wine, beer and margaritas! If you are looking for more of a sit-down restaurant, they have the Maya Grill eat at this grand Mexican dining room that features ancient-modern styling and Latin cuisines. 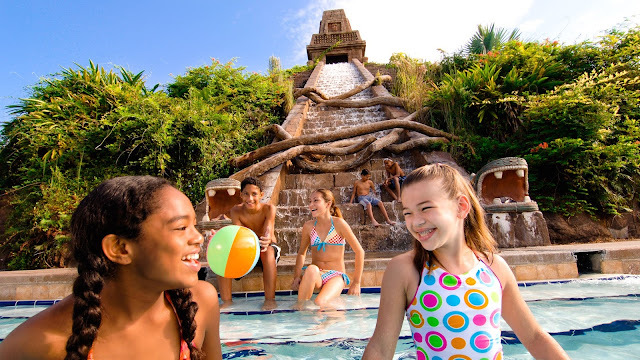 Visit the amazing pool that features a 50-foot replica of a Mayan pyramid. The water streams down the steps, it is really something to see. I am sure my daughter would have a blast playing in this pool, and she would go on the slide over and over! 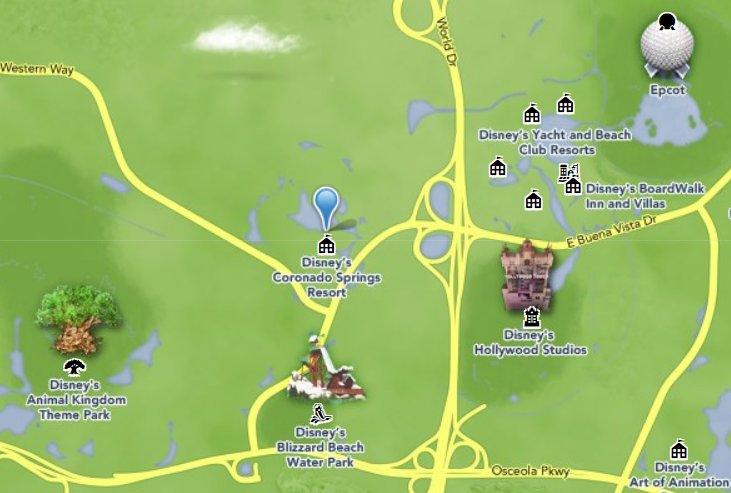 The resort is nestled between Disney's Animal Kingdom and Disney's Hollywood Studios. We were so close to Hollywood Studios that we could catch glimpses of the nightly fireworks show right from our hotel room. I enjoyed my time so much that I booked with the Bounceback offer for August. (The Bounceback offer is an offer that is extended to current resort guests, giving them a chance to book another trip with a discount. The current offer is up to 30% off your hotel stay. The offers change, so be sure to check when you visit) What hotel did I book, well I can’t say right now I want to surprise my family so I am going to have to keep mum on that one but I am sure my family is going to love it! 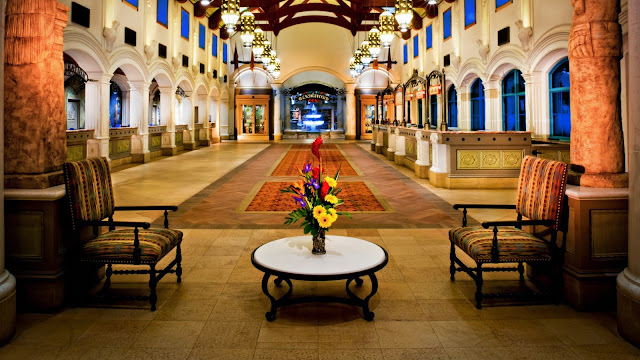 Would you like to check out the Disney's Coronado Springs Resort? Would this be a place your family would like to stay on your next trip to Disney? Be sure to check out the Walt Disney World reservations site to find a hotel that is perfect for your family. We've stayed in seven different Disney hotels, but not that one! It is on our list to get to real soon though! Wow... looks like the perfect vacation! Doesn't look like they need any construction from the photos you have, it looks amazing. Coronado is GORGEOUS! I've stayed there twice now. It is large and has a beautiful pool. Wow this Disney resort looks wonderful! I haven't been to Disney since I was in High School, but I am dying to take my little guy there in the next few years when he is old enough to appreciate it (he is only 8 months). That looks like such a magical place to stay! We love our visits to WDW, but I haven't stayed here yet. The slide only is convincing me I need to go.